Still hopeful … today feels like May 16, 2014. On May 16th last year, for the first time we voted for a Prime Minister who was born post independence, didn’t come from a single gene pool and he managed to get a thumping majority against all odds. Today, for the first time, the mother-son duo will be in a court trying to argue their case, legally. Today, for the first time in independent India, emotions aren’t running high when members of THE FAMILY are subjecting themselves to the law of the land…. the sycophants are crying but their tears have no meaning. 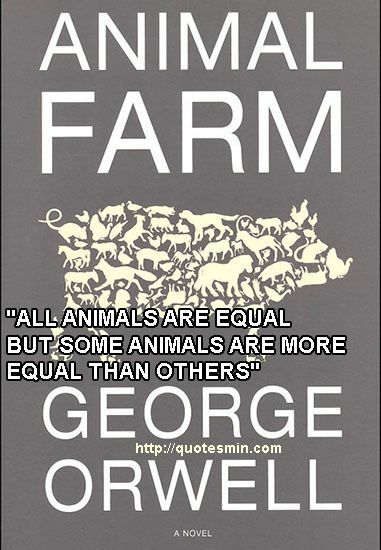 God bless George Orwell .. he knew exactly how the system works everywhere. Am still hopeful … the law will take its course and justice will be done, even if some are more equal. Am still hopeful, that the powers that are won’t chicken out and let the guilty escape. Am still hopeful, that money won’t matter… and yes, am still hopeful, a little foolishly, that the fake Gandhis will spend some real time in jail. We are a land of miracles, the latest miracle being 20000 people clearing a B.Ed exam when only 12000 appeared for it … if that can happen, why can’t I hope for this miracle too. Oh, my imagination is running wild – RaRa will come out a changed man and stop pulling up his sleeves before delivering a speech, the head sycophant will oversee the frozen family assets for a while, the sister will dump the non-entity-only-realty husband and jump into the melee and be declared the new “leader”… and the same old-new drama will unfold. Hmmmm … first things first, let the fake-G’s go through the trial, praying for the judge’s inner Buddha to prevail, then we shall see if it heralds a new national spirit.